Power pop rocker/songwriter Chuck Prophet showed his prowess on guitar, and he and his band weren't afraid to turn it up, even if it was a quiet Sunday night. The Narrows has proudly hosted Chuck a number of times over the years, and each time this Left Coast icon continues to surprise and delight. If you aren't familiar with his music, mvyradio.com should have the show in its archives soon. Silky smooth blues dude Robert Cray makes his Narrows debut March 22nd. It was a first for Crooked Still at the Narrows--a sold out show! Crooked Still proved Friday night why their fan base continues to grow. Quality musicianship and an upbeat approach. MVYRadio.com streamed it live. Should be in their archives soon. Congrats to the nice folks of Crooked Still! 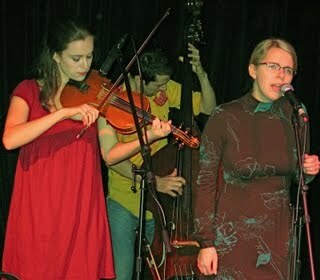 One of the most creative roots groups on the scene is Crooked Still--and they're at the Narrows tonight! Saturday night "Walking in Memphis" piano man Marc Cohn proved, for the 2nd time this year, that he has the chops beyond his one mass appeal hit. A packed house at the Narrows listened intensely to his tunes, sung with a passionate, soulful delivery that apparently made some female admirers nearly swoon. "You made my...life," one woman told your humble blogger after the concert, thanking me for something Marc Cohn did. The benefits of being a Narrows volunteer! Yes, he did "Walking in Memphis," which sounded fresh and energized. He explained that he wrote the tune after reading an article in which James Taylor explained that he overcomes writer's block by catching a plane and going somewhere he'd never been. A young Marc Cohn took his advice and went to Memphis. A former backup singer for Marc and local talent, Amy Correia, opened the show, winning new fans. Slambovians! More photos from the recent concert. Courtesy of a true photo artiste Dan Tappan. Gandalf Murphy and the Slambovian Circus of Dreams made their 2nd appearance at the Narrows Friday night, playing their quirky mixture of space folk (They have a CD called "Flapjacks from the Sky"), rock, metal and what have you. They delighted their dedicated fans with their creativity and off-the-beaten path approach. 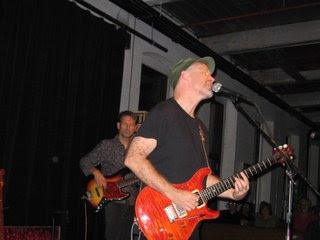 Happy 56th birthday to Narrows alum Marshall Crenshaw! Happy 82nd birthday to Narrows alum Mose Allison! Saturday night was the Narrows 8th anniversary celebration, and we did it up big with Susan Tedeschi and her band, their first visit. Of course, the show was sold out! In honor of the event patrons were given an official Narrows commemorative mug. And the official commemorative t-shirts and sweatshirt were available for purchase, listing every artist, including openers, who have performed at the Narrows over the past 8 years. Of course, Ms. Tedeschi--whose dad and brother were in the audience--charmed the crowd with her bluesy chops, impressive singing, and kickin' group of musicians performing with her. Kansans Moreland & Arbuckle opened the show with a set of blues rock that won them fans bigtime (You should have seen the line to buy their CDs after the performance!). Mvyradio.com streamed the show live on its website and two radio frequencies. Chances are the show will be archived on the site in a few days. This just in--one of the best California cool songwriters, J.D. Souther, is coming to the Narrows for the first time Saturday, January 30. He wrote a number of hits for the Eagles, including "Heartache Tonight" and "Best of My Love." You may remember his duet with James Taylor "Her Town Too" or his solo hit "You're Only Lonely." Hipper readers may remember his work with Narrows' alums Chris Hillman and Richie Furay, the Souther Hillman Furay Band. This is a special treat. More info at www.ncfta.org. Just in time for our 8th anniversary show Saturday night, the Narrows has begun selling t-shirts and hooded sweatshirts that feature the names of every act, including openers, that have played the Narrows. Your humble blogger (above) modeled the shirt (only $15 for the short sleeve version) in the Narrows office.